One of the qualities I love most about Professor Kelly is his belief in constant and never-ending improvement. Throughout the 33 years we have been together, I have seen him never be satisfied with his education or skill level. Honestly, sometimes it’s annoying. For pete’s sake, just rest and relax after an achievement (the Aunty Jen way!). My husband’s desire to learn and grow is insatiable.I always love how he wants to not only improve the skills he has but also learn new ones. 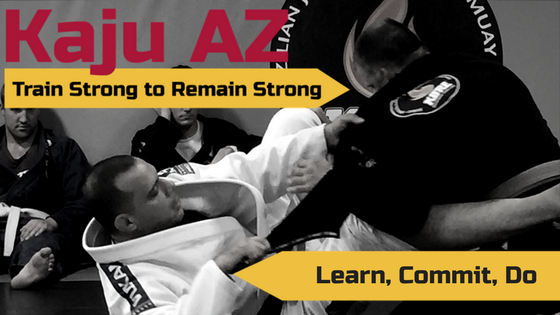 His journey in Brazilian Jiu-Jitsu is an example of that. As a Kaju/Kenpo practitioner he loves to hit (and he is good at it, really good). He told me once he wasn’t as comfortable on the ground as he was in his stand up defense. For Professor Kelly, being uncomfortable is unacceptable.So about 11 years ago, he started training in BJ And lo and behold, he began to get more comfortable as he learned new techniques, new ways of thinking and solving problems. Little by little, he gained even more skills, reached different belt levels and kept getting comfortable.In fact, he has become so comfortable that he is graduating with his black belt from his instructor Master Luigi Mondelli. 11 years! Most people lack the discipline to stick with anything for 11 days or 11 weeks or even 11 months. When things get busy or life throws the inevitable curve ball, they give up. When we do that, we stop growing physically, emotionally, and spiritually. And what a shame! Learning and mastering a skill improves all areas of our lives. Our sense of accomplishment leads to confidence and desire to keep learning. The more we learn, the more we grow and the more we can help others by sharing our skills and talents. Renowned author Stephen Covey called self-improvement “a never-ending upward spiral of ‘Learn, Commit, Do.’” I don’t know about you but being in a constant upward spiral is a million times better than a downward one. When I mention his impending achievement to Professor Kelly he just shrugs and says “so much more to learn.” Constant and never-ending improvement is never boring.Onward!